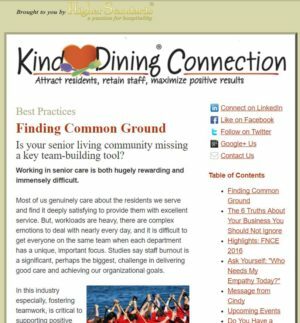 Every quarter we publish Kind Dining® Connection for senior care professionals who are working to make mealtimes a more satisfying, beneficial experience. Subscribe today to receive this newsletter directly to your inbox. After you subscribe, you will receive your free copy of 5 Ways to Change Your Dining Environment by Friday as well as our Dining Service quiz by e-mail. Want a sneak peek of what we publish in Kind Dining® Connection? No problem. View our most recently sent issue by clicking the image to the right. AlabamaAlaskaArizonaArkansasCaliforniaColoradoConnecticutDelawareFloridaGeorgiaHawaiiIdahoIllinoisIndianaIowaKansasKentuckyLouisianaMaineMarylandMassachusettsMichiganMinnesotaMississippiMissouriMontanaNebraskaNevadaNew HampshireNew JerseyNew MexicoNew YorkNorth CarolinaNorth DakotaOhioOklahomaOregonPennsylvaniaRhode IslandSouth CarolinaSouth DakotaTennesseeTexasUtahVermontVirginiaWashingtonWest VirginiaWisconsinWyomingOutside U.S. If you have specific questions, or would like to explore how to put the power of Kind Dining® to work for your community, contact Cindy Heilman, MS, DTR.